The New Acting Interior Secretary Is An Agency Insider And Ex-Oil Lobbyist As Ryan Zinke steps down amid a string of ethics investigations, his deputy David Bernhardt — a former oil-industry lobbyist and a polarizing figure — will take over at the Department of the Interior. David Bernhardt, a former oil-industry lobbyist and a polarizing figure, will lead the Department of the Interior for now as Ryan Zinke steps down. Ryan Zinke has stepped down as interior secretary, resigning as planned amid a series of ethics investigations. In a tweet he said it's been a "high honor" to serve, adding that the agency has restored public lands, improved public access and "shall never be held hostage again for our energy needs." So far the president has not nominated anyone as a permanent replacement. 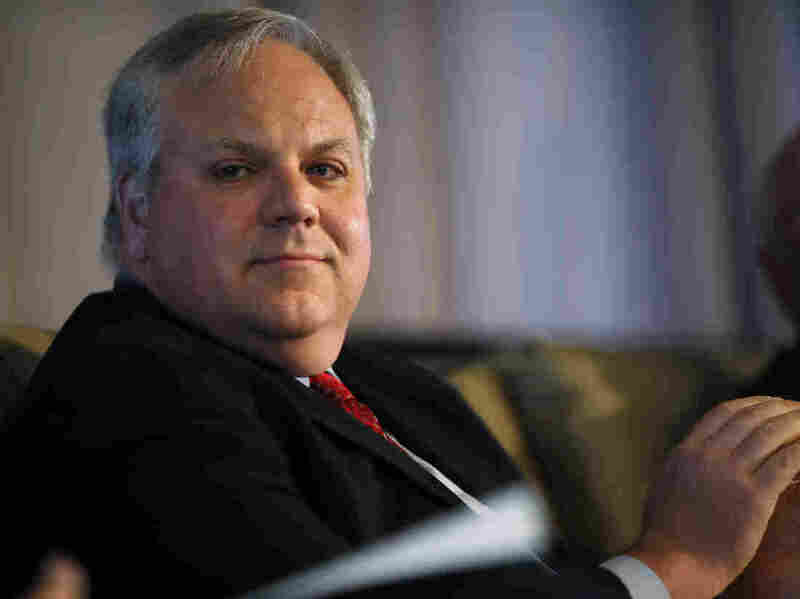 The acting secretary is Zinke's deputy David Bernhardt, a lawyer and former lobbyist for the oil industry with longtime experience at the agency. "He's thought by many to be the power behind the throne," said Jeff Ruch, executive director of the watchdog group Public Employees For Environmental Responsibility. Bernhardt is a polarizing figure, loved by the industry and assailed by environmental protection groups. From 2001 to 2009 he held a number of positions at the Department of the Interior, including solicitor. When Zinke named him as his deputy, he cited his extensive agency experience, "his esteemed legal career, and down-right love of our land and resources." Like many previous secretaries, Bernhardt also hails from the West — he's a native of Rifle, Colo. In addition to his track record in Washington governance and politics, Bernhardt also has experience in the fossil fuel industry. He worked for a Washington, D.C., lobbying firm where E&E News reported that his clients included Cobalt International Energy and the Independent Petroleum Association of America. Environmentalists argue it raises ethical questions for someone who worked on behalf of oil and gas companies to then be in charge of managing those resources. Kathleen Sgamma, president of the industry group Western Energy Alliance, said naysayers are being hypocritical. "It's always interesting to hear the enviros say that kind of thing, because they have no problem with them occupying positions when the tide is turned," she said. Case in point: the previous interior secretary, Sally Jewell, was the former head of outdoor recreation behemoth REI. Sgamma said Bernhardt's philosophy of responsible energy development on public lands is good for both American taxpayers and towns dependent on oil, gas or coal across the Mountain West. "It's not about benefiting any particular company that he might have worked for," she said. Bernhardt can "advance policies that enable that responsible energy development that benefits all Americans." The Department of the Interior manages one-fifth of all the land in the United States, including the wealth of oil, natural gas and coal below the ground. Under the Trump administration, oil and gas leases on public lands managed by the department last year generated $360 million, an almost 90 percent increase from 2016. Bernhardt sees himself as a foot soldier for President Trump's pro-energy development agenda. "The president's objectives actually represent the will of the people," Bernhardt said during a speech to the conservative Washington think tank the Heritage Foundation in September 2018. "That means that at Interior, our goals are focused on the president's goals." Those goals include deregulation and relaxing environmental standards for oil and gas companies. Bernhardt is widely known to have a surgical legal mind, and he's helped steer some of biggest efforts within the Interior. For instance, late last year he erased a chapter on climate change from the department's handbook. Ruch said Bernhardt also advocated for rolling back Endangered Species Act protections and relaxing methane rules for oil and gas companies. "He views Interior as an entity that should be renamed the Department of Energy and Mining," Ruch said. The Trump administration's energy dominance agenda is similar to George W. Bush's administrative goals. That's where Bernhardt first served as a top aide and eventually a solicitor within Interior. Prior to that, he worked for the D.C. lobbying firm Brownstein Hyatt. Its clients included a host of natural-resource extraction companies. After Barack Obama was elected, Bernhardt left the Interior and rejoined Brownstein Hyatt. Once Trump took office, however, Bernhardt was nominated to help run Interior once again. While Sgamma and Ruch differ on whether Bernhardt's leadership is good for the country, they agree that nothing much will change at Interior as Zinke leaves and Bernhardt takes the reins.